Do the words “Toilet Training” make you want to run and hide? As much as the thought of a baby out of nappies is a great one, the actual process of toilet training can be daunting. 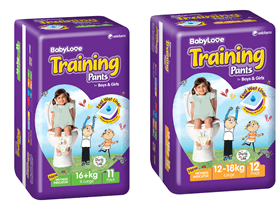 I’ve previously shared some of my Favourite Toilet Training Tips and Resources, and today I am sharing a review of the BabyLove Training Pants (there’s also a chance to win some too!). For the last 2 weeks I have been testing the BabyLove Training Pants, and the results are in! I have been very impressed with these and have already added them to this week’s shopping list. If you don’t know the difference between pull ups and training pants, don’t be embarrassed – I didn’t either! The key difference is the “feel wet” liner which helps your toddler learn the difference between wet and dry. It’s the final step of the toilet training process. Thanks to the feel wet liner, within days, my toddler was indicating that she wanted to change her nappy more often (great!) and was using the toilet herself a little bit more than she had been. In the past I’ve found some brands of pull up style nappies have leaked, however we tested two packets of these and had no leakages at all. The BabyLove training pants are definitely a step in the right direction towards toilet training and with the new Charlie and Lola designs, they’re a hit with the kids too! WIN 1 of 2 BabyLove Training Pants Prize Packs! To enter leave a comment below sharing your best toilet training tip. To wait till they are showing signs of being ready, just adds to frustration if you push them when they are not ready. 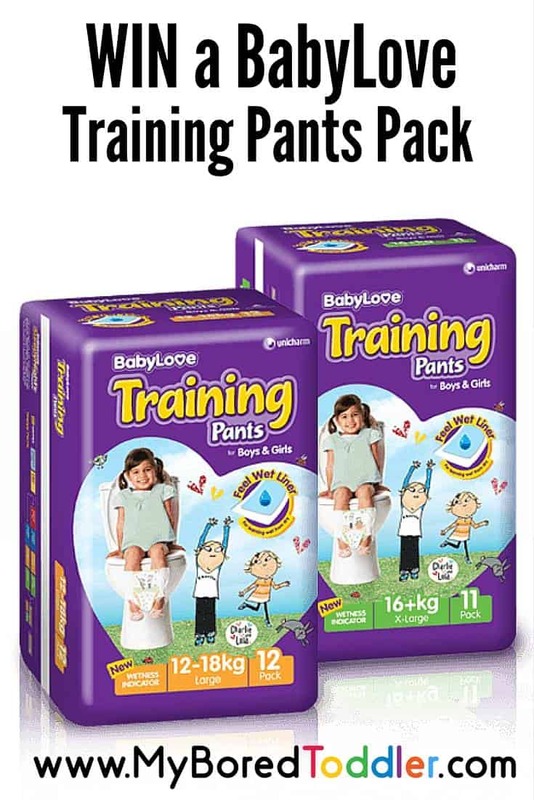 If I had a best toilet training tip I probably wouldn’t be trying to win some training pants! My only tip was one my sister shared with me and it is pure bribery, one smartie for wees, two for twos! We have the potty in the lounge. The tv and books can make good distractions, and constant praise too. It’s hard, and sometimes it gets frustrating for ALL involved, so patience is key. My best tip is to be patient and use a rewards system! My youngest does well some days but not so well other days, but keeping reminding her of getting a sticker for even the smallest of steps (such as noticed she’s wet, washing her hands, letting me know she needs to go etc) keeps her motivated! Also, don’t get angry or make them feel ashamed if they have an accident. Every child is different and some train easier than others, and praise goes a long way! Wait until they show signs of readiness and ensure they are drinking plenty of water to avoid constipation. It can be a stressful time for everyone involved, so lots of P’s: patience, praise and positivity help too.